There are many powerful arguments for junking the internal revenue code and replacing it with a simple and fair flat tax. It is good to have lower tax rates in order to encourage more productive behavior. It is good to get rid of double taxation in order to enable saving and investment. It is good the end distorting preferences in order to reduce economically irrational decisions. Today, let’s review a feature of good tax reform that involves the second and third bullet points. Under current law, there is double taxation of corporate income. This means that companies must pay a tax on income, but that the income is then taxed a second time when distributed to the owners of the company (i.e., shareholders). This means that the effective tax rate is a combination of the corporate income tax rate and the tax rate imposed on dividends. And this higher tax rate is an example of why double taxation discourages capital formation and thus leads to lower wages. But this double taxation of dividends also creates a distortion because there isn’t double taxation of corporate income that is distributed to bondholders. This means companies have a significant tax-driven incentive to rely on debt, which is risky for them and the overall economy. Curtis Dubay has a very straightforward explanation of the problem. In debt financing, a business raises money by issuing debt, usually by selling a bond. In equity financing, a business raises funds by selling a share in the business through the sale of stock. The tax system provides a relative advantage to financing capital expenditures through debt because under current tax law, businesses can deduct their interest payments on the debt instruments, but dividend payments to shareholders are not deductible. Thus, equity is disadvantaged because it is double taxed while debt correctly faces only a single layer of taxation. 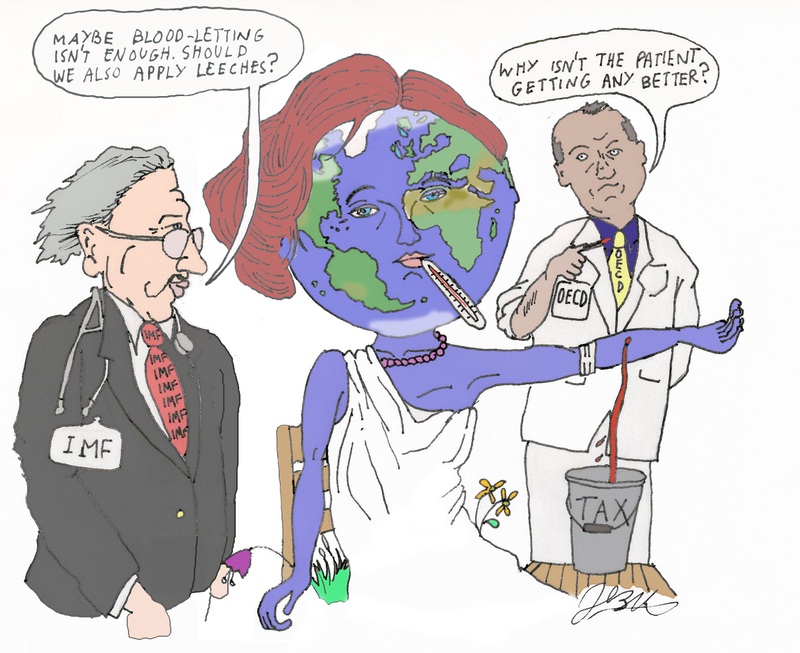 By the way, when public finance people write that something is “not deductible” or non-deductible, that simply means it subject to the tax (much as the non-deductibility of imports under the BAT is simply another way of saying there will be a tax levied on all imports). But I’m digressing. Let’s get back to the analysis. Curtis then explains why it doesn’t make sense to create an incentive for debt. The double tax on equity makes debt a relatively more attractive way for businesses to finance themselves, all else equal. As a result, businesses will take on more debt than they otherwise might. …This is a serious problem because carrying significant amounts of debt can make businesses less stable during periods when profitability declines. Interest payments on debt are a fixed cost that businesses must pay regardless of their performance. This can be onerous and endanger a business’s solvency when profits fall. He points out that the sensible way of putting debt and equity on a level playing field is by getting rid of the double tax on dividends, not by imposing a second layer of tax on interest. …it does not make sense to equalize their tax treatment by eliminating interest deductibility for businesses. Doing so would further suppress economic growth, job creation, and wage increases. Instead, Congress should end the double taxation of income earned through equity financing in tax reform by eliminating taxes on saving and investment, including capital gains and dividends. Incidentally, what Curtis wrote isn’t some sort of controversial right-wing theory. It’s well understood by every public finance economist. The International Monetary Fund, for instance, is generally on the left on fiscal issues (and that’s an understatement). Yet in a study published by the IMF, Ruud A. de Mooij outlines the dangers of tax-induced debt. Most tax systems today contain a “debt bias,” offering a tax advantage for corporations to finance their investments by debt. …One cannot compellingly argue for giving tax preferences to debt based on legal, administrative, or economic considerations. The evidence shows, rather, that debt bias creates significant inequities, complexities, and economic distortions. For instance, it has led to inefficiently high debt-to-equity ratios in corporations. It discriminates against innovative growth firms, impeding stronger economic growth. … recent developments suggest that its costs to public welfare are larger—possibly much larger—than previously thought. …The economic crisis has also made clear the harmful economic effects of excessive levels of debt… These insights make it more urgent to tackle debt bias by means of tax policy reform. Well, just as Curtis Dubay explained, there are two options. What can be done to mitigate debt bias in the tax code? In a nutshell, it will require either reducing the tax deductibility of interest or introducing similar deductions for equity returns. And the author of the IMF study agree with Curtis that the way to create neutrality between equity and debt is by using the latter approach. Abolishing interest deductibility would indeed eliminate debt bias, but it would also introduce new distortions into investment, and implementing it would be very difficult. …The second option, introducing a deduction for corporate equity, has better prospects. …such an allowance would bring other important economic benefits, such as increased investment, higher wages, and higher economic growth. And Mooij even acknowledges that there’s a Laffer Curve argument for getting rid of the double tax on dividends. The main obstacle is probably its cost to public revenues, estimated at around 0.5 percent of GDP for an average developed country. …In the long term, the budgetary cost is expected to be significantly smaller, since the favorable economic effects of the policy change would broaden the overall tax base. And in fact, a number of countries have successfully introduced variants of the allowance for corporate equity, suggesting that it is not only conceptually desirable but also practically feasible. Another study from the International Monetary Fund, authored by Mooij and Shafik Hebous, highlights the damage caused by luring companies into taking on excessive debt. Excessive corporate debt levels are a serious macroeconomic stability concern. For instance, high debt can increase the probability of a firm’s bankruptcy in case of an adverse shock… Given this concern about excessive corporate debt, it is hard to understand why almost all tax systems around the world encourage the use of corporate debt over equity. Indeed, most corporate income tax (CIT) systems allow interest expenses, but not returns to equity, to be deducted in calculating corporate tax liability. This asymmetry stimulates corporations to use debt over equity to finance investment. 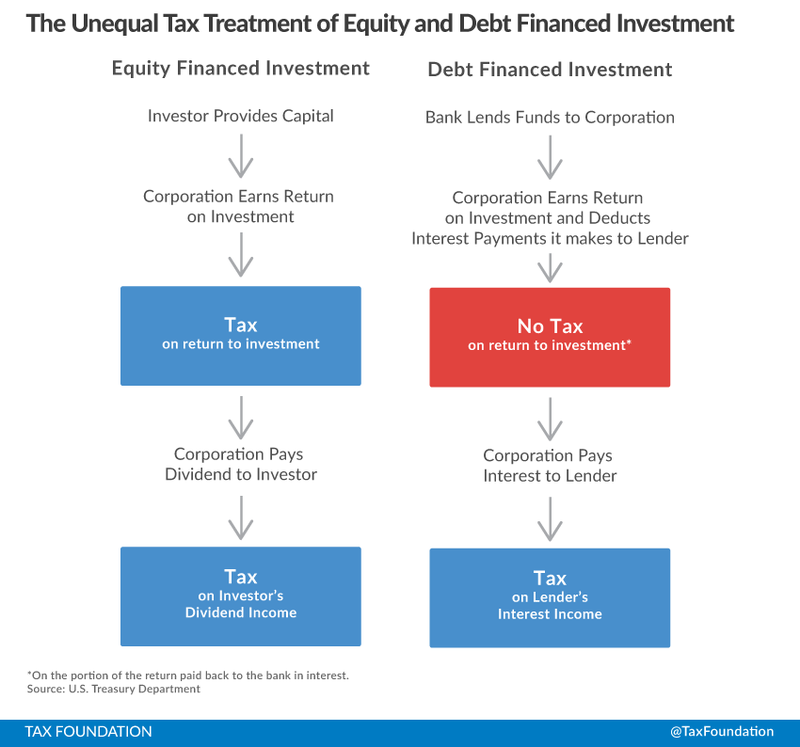 We get the same explanation of how to address the inequity in the tax treatment of debt and equity. Effectively, there are two ways in which debt bias can be neutralized: either by treating equity more similar as debt by adding an allowance for corporate equity (ACE); or by treating debt more similar for taxation as equity by denying interest deductibility for corporations. And we get the same solution. Stop double taxing dividends. ACE systems have been quite widely advocated by economists and implemented in some countries, such as Belgium, Cyprus, Italy, Switzerland, and Turkey. Evaluations generally suggest that these systems have been effective in reducing debt bias… Yet, many countries are still reluctant to introduce an ACE due to the expected revenue loss. By the way, the distortionary damage becomes greater when tax rates are onerous. A recent academic study addresses the added damage of extra debt that occurs when tax rates are high. There’s some academic jargon in the above excerpt, so I’ll also include this summary of the paper from the Tax Foundation. A new paper published in the Journal of Financial Economics finds that countries with high tax rates on corporate income also have higher corporate leverage ratios. …Using survey data of multinational corporations from the Bureau of Economic Analysis (BEA), the authors…find that businesses that report their income in high tax jurisdictions have corporate leverage ratios that are substantially higher than those in low tax jurisdictions. More precisely, they find that a business facing an average tax rate of 35% has a leverage ratio that is 7.1% higher than a similar firm facing an average tax rate of 25%. By the way, here are the results from another IMF study by Mooij about how the debt bias is connected to high tax rates. We find that, typically, a one percentage point higher tax rate increases the debt-asset ratio by between 0.17 and 0.28. Responses are increasing over time, which suggests that debt bias distortions have become more important. The bottom line is that the U.S. corporate tax rate is far too high. And when you combine that punitive rate with a distortionary preference for debt over equity, the net result is that we have companies burdened by too much debt, which puts them (and the overall economy) in danger when there’s a downturn. So the obvious solution (beyond simply lowering the corporate rate, which should be a given) is to get rid of the double tax on dividends. The good news is that Republicans want to move in that direction. The not-so-good news is that they are not using the ideal approach. As I noted last year, the “Better Way Plan” proposed by House Republicans is sub-optimal on this issue. Under current law, companies can deduct the interest they pay and recipients of interest income must pay tax on those funds. This actually is correct treatment, particularly when compared to dividends, which are not deductible to companies (meaning they pay tax on those funds) while also being taxable for recipients. The House GOP plan gets rid of the deduction for interest paid. Combined with the 50 percent exclusion for individual capital income, that basically means the income is getting taxed 1-1/2 times. But that rule would apply equally for shareholders and bondholders, so that pro-debt bias in the tax code would be eliminated. For what it’s worth, I suggest this approach was acceptable, not only because the debt bias was eliminated, but also because of the other reforms in the plan. …the revenue generated by disallowing any deduction for interest would be used for pro-growth reforms such as a lower corporate tax rate. Though I can’t say the same thing about the border-adjustability provision, which is a poison pill for tax reform. P.S. While the preference for debt is quite harmful, I nonetheless still think the worst distortion in the tax code is the healthcare exclusion.